Hahriette, the current reigning champion of Spiderdome faced her greatest competition yet. Another Daring Jumping Spider. Clarise the Killer was a little smaller than Hahriette, but from the white spots on her back, she was older and more experienced. It was a match to remember as the two hunters of the spider world faced off with quick attacks and fast retreats. Watch the video and see for yourself, but be warned. It is a grueling finish. Did we get a new champion? Does Hahriette continue her reign of power? Okay, I will spoil this one for you. I am proud to say, Hahriette has shown, once again, she is the Queen of Spiderdome and still our beloved champion! Hahriette is now 3-0. I do not look for spiders to face off in Spiderdome. I only take volunteers. If they enter my home, they volunteer. I believe my house is my territory and outside is theirs. Any spider that enters my domain faces the punishment of death. Whether it is by my wife with a shoe, one of two cats, or being entered into Spiderdome. Personally, I prefer it to be Spiderdome. 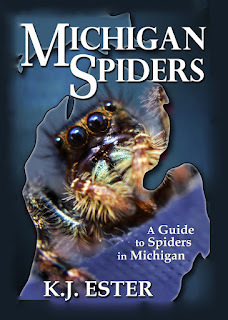 I get entertainment, Michigan Spiders gets another match to display, and the spider gets a chance to become the new champion that will be pampered with a good life style and a lifetime supply of crickets. This was very interesting to watch. I've never seen spiders fight before! Hahriette was definitely the confrontational one -- her(?) victim didn't want anything to do with it! I hope you make more of these... is that sadistic? It seems like you are just helping to create stronger, bigger, more aggressive spiders by allowing the winner to live...at least if you let it go. It's survival of the fittest baby! Cool video.